Light up your way in and saw your way out! What a combo deal this is. The bladelight Hunting knife has six white LED lights in the handle that can be turned on with just one push of a button. The handle is an orange color-to help you see it- and the handle has a water resistant housing around it. The satin finished blade is a 3.8 folding style knife that has a kydex sheath. The blade steel is 8Cr13MoV and the overall knife is 8.5 long. The folding saw is made of a tempered high carbon steel that is 8.25 long and weighs 5.9 oz. The handle is made of kraton rubber which gives it a soft grip for better comfort and control and comes with a nylon sheath. This saw can cut down brush, small logs, branches and bushes. Two great favorites in one package. 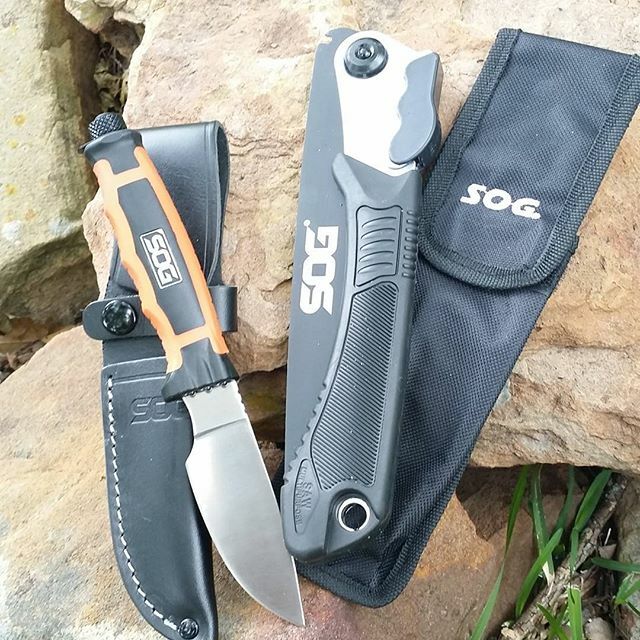 Own a SOG Combo Pack Bladelight Hunt and Folding Saw? Tell us how you like it! Got a question? Ask! Somebody will answer!